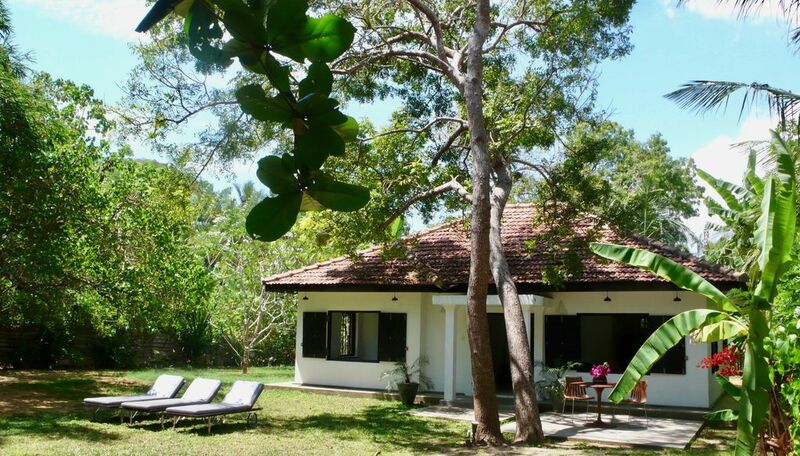 Kumbuk, a two bedroom hideaway, is set steps from Mawella Beach with a large garden. Its situated on the western end of the two kilometre long, crescent shaped, sandy and tranquil Mawella Beach near Tangalle on the Indian Ocean in the very south of Sri Lanka. Kumbuk is named after a tree in its garden. Fully staffed including a shared cook. Kumbuk's living room has two sofas and desk and doors opening onto its garden. It has a large double bedroom with a large double bed (six foot wide) with a mosquito net and ceiling fan. There is a second twin bedroom as well. The bathroom is finished in traditional Sri Lankan polished plaster providing a large shower, loo and basin. Kahumba’s shower is fully walled and partially open air. It also has a separate guest loo with basin. Kumbuk has one large double bedroom and a twin bed room. All bed linen is plain white 100% cotton. The prevailing on shore sea breeze varies in strength but generally provides Kumbuk with a cool and airy atmosphere augmented by ceiling fans in all rooms. It does not have air conditioning. Kumbuk is fully equipped for self catering with china, glasses and cookware. The kitchen has a fridge, oven and a separate gas hob. It does not have a dishwasher or microwave. Alternatively, guests can book and eat local restaurants at the nearby hotels including Amanwella, Buckingham Place, Coco Tangalle or the small café on Mawella Beach. Kotamba and the other two hideaways owned by the same team, share an onsite manager, a cook and a cleaning team. If you like, the team will shop, prepare, serve and tidy up after meals. You choose what you would like to eat, the team will purchase in the local town, subject to availability, and you then pay just the retail cost of the ingredients plus transport. toilet, shower, Large bathroom with shower. Toiletries provided. There is a table and chairs in the kitchen for breakfast, an outdoor patio with another table and two chairs and then a stand along pergola in the garden with a dining room table and six chairs. This is my second trip to Kotamba. It is one of my favorite places to relax in the world. The food prepared by the onsite staff is absolutely exquisite. While the pictures of the two houses are not dramatic, actually living in them allows you a chance to appreciate the aesthetic detailing. One of the most romantic retreats you could possibly discover. It is not a place to meet and make new friends, though the fisherman of the local village flash friendly smiles. It is more a place to read, write, swim, Sun, lounge, and unwind. Not a surfing beach but some of the best salt water swimming/floating to be found ANYWHERE. Thank you so much for this review which captures what we think is the essence of Mawella Beach Hideaways - peace and tranquility on a lovely swimming beach!